Class starts with an icebreaker before a group of eight girls settle into their seats. The lesson turns to an exploration of values, such as being self-aware, having healthy relationships and demonstrating leadership. The girls are sophomores at Julian High School, in Chicago’s East Beverly neighborhood on the South Side. It’s the sister program to one that’s received plenty of attention: Becoming a Man, or BAM. Both are designed to provide young men–and in this case young women–with mentoring and group counseling. 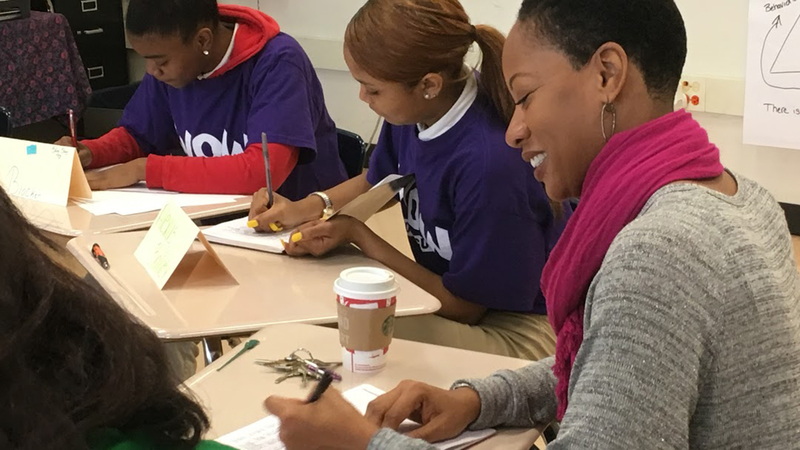 While BAM has reached thousands of young men in Chicago Public Schools in the last 15 years, this program, called Working on Womanhood, or WOW, began quietly just five years ago. Youth Guidance is the nonprofit that operates both programs. Its research shows that 84 percent of WOW participants have experienced five or more major traumatic events in their young lives. And 82 percent have had someone close to them die, while 67 percent report having been slapped, hit or punched by someone. Before beginning their WOW therapy, 72 percent of WOW girls reported some degree of depression. Sixteen-year-old Taniyia’s favorite value is leadership. “I think leadership stands out to me the most because the way you carry yourself … if you carry yourself in a nice way you can be a leader to somebody, and they can look up to you,” she explained. She hopes it will help her with her with her plans to become a nurse. “Because I want to help people out; that’s my goal that I want to do when I get older,” Taniyia said. Her classmate, 15-year old Shontia, says she’s using the lessons learned in WOW to find her way through high school. “Freshman year it was really hard, but I’m starting to like it; get the hang of it. That’s one of the things about healthy relationships, because healthy relationships help me bond with others, put myself in people that want to do something with (themselves), not people with drama and stuff,” she said. Julian High School is rated a level two school by CPS, and it’s on intensive support. Its population is 96 percent low-income. But assistant principal Michelle Brumfield believes her student body is rich in strong students, despite the school’s challenges, which is why she makes it a point to participate in weekly sessions. WOW is in 22 CPS schools this year, reaching 1,000 seventh- through 12th-grade girls, like Shontia and Taniyia. WOW research shows 67 percent of girls reported decreased depression after one year of WOW counseling. “I kinda look at WOW like it’s an IV, you know, you go in the hospital and they hook you up and you might be dehydrated, WOW is in that pouch, and there’s a constant drip into our circle for our girls to give them balance, so they can do better and succeed in school and life,” said Day. At the end of the session, the girls check out with each other, describing how they feel in one word. Other words like “hopeful,” “motivated” and “proud” describe their feelings, arming them with the confidence and mental focus they’ll need to finish the day. Though the city isn't providing additional funding for WOW this year, the mayor's office has said it plans to expand WOW by 30 percent to serve 1,300 young women by 2018. The University of Chicago Urban Labs, which has studied the effects of BAM, plans to research the effects of WOW starting next year. Chicago’s At-Risk Youth: Are Mentoring Programs the Answer? Sept. 26: The mayor makes mentoring programs a centerpiece of his anti-violence strategy. How much impact could they have? June 28: Becoming A Man aims to help group members rethink their responses to high-stress and potentially dangerous situations.